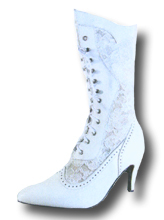 Cultured Cowboy carries a nice selection of Western Bridal Boots. Choose from any of the following for the perfect finishing touch for your Western Wedding. Dresses for your bridal party are shown under our sites for Western Wedding Gowns, Flower Girls' Dresses and Bridesmaids' Dresses.